Chicago Marathon - The Bank of America Chicago Marathon, Prepare With Flat-Surface Marathon Training ! "Experience the Flat, Fast, Chicago Marathon Course for Some Personal Best Results !" Chicago Marathon, the Bank of America Chicago Marathon is usually arranged in October in the "Wind City" and the date for the 2008 race : 12th of October. Registration is done very easy, online (for 110 USD for US citizens and 130 for international) and unlike the Boston - you do not have the qualifying standard you have to meet for running it ; or lottery like New York Marathon. This is partly due to the very flat course,route - but also the fact that the temperature in Chicago at that time is usually ideal for marathon running. New ! Have you run the Chicago Marathon - or wonder what others think about it ? Click to share a review, your favorite Chicago Marathon tips, with visitors to this page! 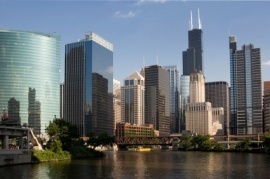 The Chicago is part of the "Big five". Which means Chicago is part of the five races that make up the World Marathon Majors, and the Chicago Marathon is not only one of them, but it's among the fastest growing race in the world. The reason for that is largely one of geography. the topography of Chicago is rather flat. for marathon runners, this is the best sort of course to run if you want to set records. So, unlike Boston with its "Newton Hills" or the ups and downs of New York, many a personal and world records have been set over the thirty year life of the race. Before we continue though I want to tell you about my own special Chicago, I have a very personal relationship to Chicago. For a year when I was a 17 year old runner and student I stayed in Chicago for the last year of high school running both cross country and track for York High School. Since then, Chicago has been my kind of city - windy or not. Enough personal, now lets look at Chicago as a marathon. From a small start, steady growth, to a main marathon in the world - back in October of 1977, 4,300 people participated in the "Mayor Daley Marathon". Today it is the Bank of America's Chicago Marathon, and there are a lot of runners with corporate sponsors taking part in it. The race has grown steadily since those early days with 45,000 people running it in 2007. On the course that is as fast as ever - and of you look at the course you'll understand why. The Chicago Marathon starts and ends in Grant Park, starting at the north end, above Buckingham Fountain, and ending at the south entrance, right at the intersection of Columbus Drive and Roosevelt. In between, it weaves and meanders through the city; as far north as Wrigleyville, and then down and west to loop through Greektown, and then as far south as Bronzeville. Along the way, the runners are treated to a true scenic tour of the community as they see Chinatown, Little Italy, and a host of other city delights. As scenic as it seems thought - the marathon is 42 k / 26 miles of heavy impact on the body. Usually it's been due to health factors of the racer, but (ironically) there was one case of a person overheating, and another of hypothermia. Such incidents point out the importance of being in good health when you run, and keeping a close eye on your body as you run. This you can see in the Chicago Tribune Marathon Video from the 2007 race, above - as well as get a "visual view" on Chicago as a marathon. How can I register for Chicago Marathon ? Registration for Chicago is easily done online. they run a very "open" policy for both US and international entrants. You can click here (link out - to official page) to check out their registration page where all of that is done. fee is a bit over 100 USD As mentioned above, the fee is a little over 100 USD, well worth is for one of the prime marathons in the world. the maximum time is currently 6 1/2 hour for finish. Like pointed out before, the Chicago Marathon has always shown very, very fast times. Much faster than the New York City Marathon and Boston Marathon for example. Together with the Berlin Marathon and London Marathon, this has been the place for World Records that last ten or so years. WR in 1999. In the 1999 race Khalid Khannouchi won in a new world record of 2:05:42. WR in 2001 and 2002. In both 2001 and 2002 we saw world record in the women's field with Catherine Ndereba and Paula Radcliffe. The 2007 results showed Patrick Ivuti for the win in a modest 2.11. Largely because of the heat. Now, then, what is the best way to train for this fast marathon ? Almost like London - deal with the continous flat surface when training for Chicago Marathon. Deal with the flat surface. The main thing is to learn how to deal with the flat surface for a very long distance. Few hills, means very monotonous running. No problem for those in Chicago area.. If you are training in the Chicago area, that will be no problem, as it is usually dead-flat miles and miles to go. Find som long-flat streches. But if you train in a particularly hilly area, it may be a good idea to to find some long-flat stretches to do some of your workouts. This will help you deal with this. Another thing is to throw in a half marathon a few weeks before. For those already situated in Chicago or around, you can for example run the Chicago half marathon that is hosted in the middle of August. This is a great test of "where you are", a well as the 5k/10k races you want to throw in there. Big Prize Money In Chicago As Well as a "Big Heart For Charities"
Running Chicago and you'll be supporting a good cause.. 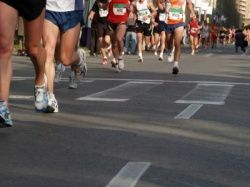 The race is also known for having one of the largest prize pool of any marathon in the world; $750,000 at the '07 race, and for raising millions for charity. In '06, just under ten million was raised for a variety of charities. Bank of American has now taken over the Chicago Marathon (after buying the LaSalle Bank) and has promised to continue this charity focus. Finally, Chicago, The "Windy City"
Finally, Chicago is much more than a marathon. Of course, Chicago is so much more than just its marathon. Carl Sandburg called it the "City of the Big Shoulders" and the "Player with Railroads and the Nation's Freight Handler". Many know the old legend of Mrs. O'Leary's cow and the Great Chicago Fire, and the city has much to draw people to it. Situated on Lake Michigan, it has miles of beautiful beaches. While not the best place to visit during the marathon (in October), there are countless other attractions. In Chicago you have the Navy Pier with plenty of fun for the whole family, and you can take a boat tour from there as well. If you love a museum, head on over to Museum Campus; it includes the Shedd Aquarium, the Field Museum, and the Adler Planetarium. Of course, this is but a small taste of what the city and surrounding communities have to offer. So, no matter what your area of interest, or what some family members want to do; after the marathon, you can probably find it in Chicago! Your Chicago Marathon Review ! Have You Run The Chicago Marathon ? Then we would love to hear your opinion..